My daughter keeps forgetting her glasses. It’s inconceivable to me how she could. I’ve been wearing glasses since 4th grade. Without them, my world is a blurry mess. But she seems quite happy to go about her life with a fuzzy view of the world. Now and again it causes problems. She can miss directional signs when she’s trying to find her way somewhere. She can’t read everything her teacher writes on the board. Even still, she seems much less worried about where her glasses are than I am. As I listen in on discussions happening in our churches today, and among Christians online, I can’t help but think that a whole lot of us are like my daughter. Quite content to live our lives missing a critical lens we’ve been given. Here’s a very recent, raw, example. A few days ago, my heart was aching. The world is always an awful place, but in the past few weeks, it seems that awfulness has been more clear and pointed. Syria. Charlotte. A ridiculous election and the depths of ill-will and immaturity it has revealed in our national life. I spend a lot of time on social media, and the tone of the conversation there of late has been vitriolic. Then came the Skittles meme. You’ve seen it. A bowl of Skittles, with text suggesting that if there were three poisoned Skittles in the bowl, you wouldn’t eat any. Syrian refugees are like poisoned Skittles, the analogy suggests, because some of them might be terrorists. The implied action: Keep all Syrian refugees out of America because you can never tell who is dangerous. The one that took me aback, though, was the woman who told me this: She said God clearly hated the Philistines in the Old Testament, and ISIS are just the modern-day Philistines. To honor God, we needed to hate them, too, and wipe them out. She said my speaking of forgiveness was against God’s revealed will. How our fuzzy vision keeps us from seeing. Oh man… My head spun. I couldn’t even…. Then I remembered the lenses the lenses we keep forgetting when we leave home and head out into the culture the lenses that change how we see everything. You see, as followers of Jesus, we’ve been given new lenses, a new way to see. Like glasses, this new way of seeing clears up the fuzzy view of others we so often live with. What are those lenses? The lenses are Jesus. He told us, “If you’ve seen me, you’ve seen the Father.” How does that relate? Well, if you wonder how God related to someone — anyone, even those who set themselves up as our enemies — you need to look at Jesus. How did Jesus relate to enemies? “Turn the other cheek,” he said. “Give your coat when they ask,” he said. “Love your enemies and pray for those who persecute you, so that you may be sons of your Father in heaven.” That’s in Matthew 5. We see this not just in his word but in his actions. How did he treat the Samaritan woman? How did he treat the Canaanite woman? How did he treat the soldiers who came with swords to arrest him? Our fuzzy vision of our world suggests the most important thing is worrying about our security. We see threats so clearly and always prioritize self-protection, and always, at the expense of others. When we wear the Jesus lenses, we see differently. With our view sharpened, we can see the most important thing is the hard work of figuring out how to love in painful, complicated situations where it might cost us. Were Philistines killed in the Old Testament? Yep. But those passages are not my marching orders. Neither are they yours. If we are followers of Jesus, then our marching orders come from Him. Feel uncomfortable, if you must. Worry about your security (even though Jesus tells us in the Sermon on the Mount this is pointless). But never, ever, set aside the lenses that change how you see. Jesus is our way. Yes, he’s our way to heaven. But today, right now, He is our way to live in the world. It’s scary because the world is a dangerous place. But it’s transformational, too. 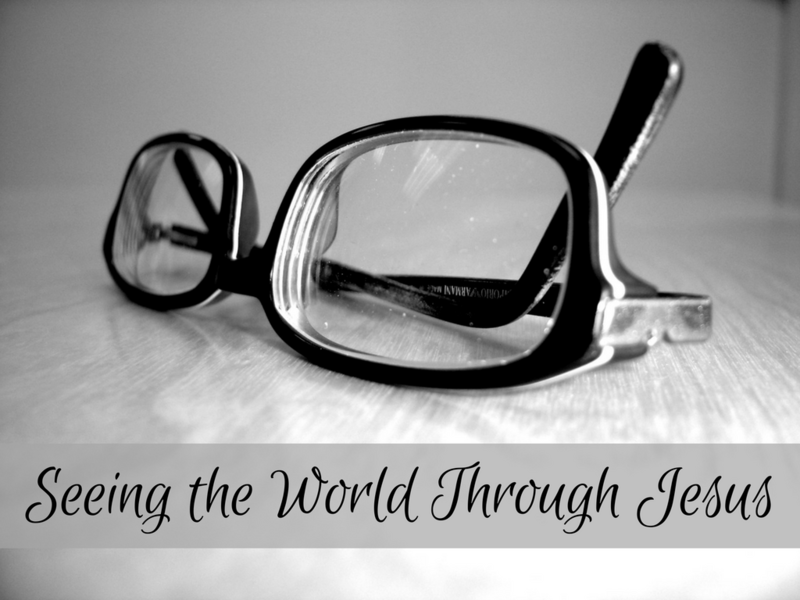 Seeing the world through the Jesus lenses will change us and how we relate to others. It can change the people around us. It's God's plan to change the world.